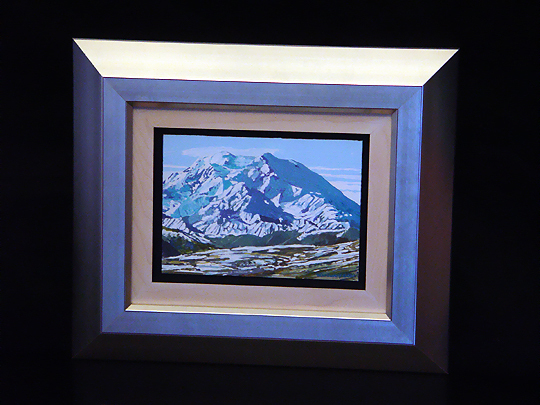 OIL ON COMPOSITION BOARD, 5" BY 7"
This very nice small work by Kesler Woodward depicts Denali, also known as Mount McKinley, the tallest mountain in both Alaska and all of North America. Denali is Athabascan for "the big one"; Kesler told me that most Alaskans prefer to use the Native American name for the mountain, rather than the name given to the mountain by gold miners in the late 19th century. Denali has reached almost iconic status among Alaskans... it's very recognizable. When I spoke with him, Kesler told me that he was about 50 miles away from Denali when he painted this scene... the mountain is even more impressive than Mount Rainier, rising more than nineteen thousand feet above the surrounding terrain. This view of Denali is from the east, on the single road that runs through Denali State Park. The reason why this work is named First Denali is simple; even though he has lived in Alaska for most of his adult life, he never painted Denali until 2001. This work is the very first painting of Denali that he created. Since this work, he has gone on to produce some magnificent and VERY large paintings of Denali. I really like the use of blue and white in this work to convey shadows and light. There is a very abstract quality to this work that makes it even more attractive to me... trying to make the painting too realistic might have ruined it. It's a small painting, but what it shows is a HUGE mountain. Very cool! Click here to return to the Collection.